What is Pet Gear Designer Pet Stair III? The Pet Gear Designer Pet Stair III is a 3-step set of stairs that you can place next to tall furniture like a chair, couch, or bed. The Pet Gear Designer Pet Stair III protects your pet's joints from the pressure of jumping on and off furniture. It has wide, deep steps for easy up and down for both small and large pets, and includes a carpet tread on each step to add traction and make your pet feel safe while climbing to his or her favorite spot. 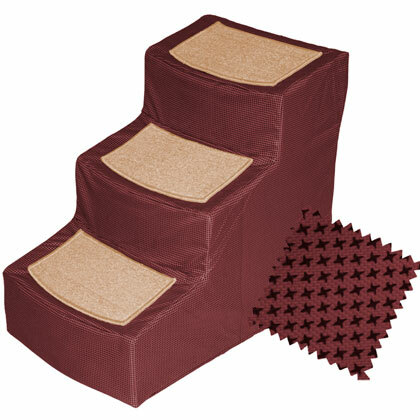 The Pet Gear Designer Pet Stair III comes in four color fabrics to match most home decor, and it can easily be removed. The Pet Gear Designer Pet Stair III is perfect for older pets, pets with joint issues, or pets just recovering from surgery. The wide, deep steps allow a smaller dog to have his or her whole body on each step, and gives larger dogs the ability to comfortably climb the stairs. The incline reduces the amount of stairs needed to climb, which eliminates stress on your pet's joints and the carpet treads help ensure footing. The cover and carpet treads are removable and machine washable, and the stairs are easy to assemble with no tools required. The Pet Gear Designer Pet Stair III requires no tools for assembly. For complete assembly directions, please see Pet Gear Designer Pet Stair III Instructions. Move your Pet Gear Designer Pet Stair III in front of any piece of furniture in your home. When not in use, store your Pet Gear Designer Pet Stair III in a corner away from children and pets. Some pets may be wary of the Pet Gear Designer Pet Stair III, so try using a treat to coax your pet onto each step until he or she makes it to the top.